We’ve had a time, trying to get our “home schooled” kids set up for work, or drivers licenses, because the businesses want a school ID that is “legal like a public school ID” or our documents do not have an official seal, etc. Have you ever had this problem? Do you make ID’s for your kids? I used your free printable high school transcript, which is great, but since I didn’t type the copy and there was no official public school seal, they shied away from it. 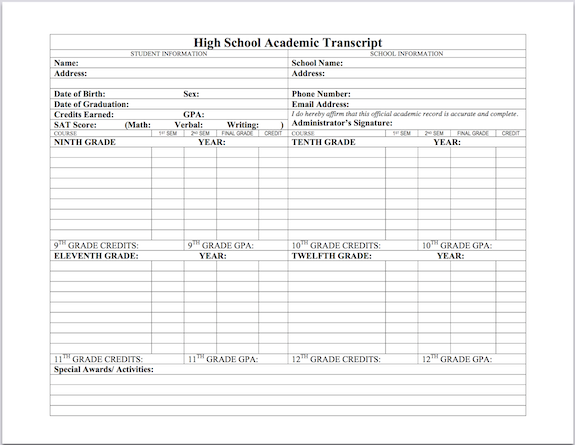 We haven’t done so when applying for driver’s permits, but for college admissions, we normally do have our transcripts notarized. You might try that, too, if the DPS or potential employers still shy away from the printed copy of your student’s transcript. It isn’t difficult to do this. If you don’t already know somebody who can notarize the transcript, do a Google search to find a notary public in your area. This is totally optional, but I also ordered a seal embosser with the name of our homeschool on it, which I used on both transcripts and diplomas. It adds a nice touch, and with the number of children we have, it will see a good amount of use by the time we finish this homeschool journey! I designed our IDs myself using Pages on my Mac. They include each student’s name, photo, and school year, plus the logo from our local homeschool support group. If I figure out how to make an editable template for those, I’ll upload that to this site, as well. In the meantime, if you haven’t already done so, I suggest you read this post. It’s all about making the most of the high school years. Have your high schoolers read it, too! It explains how they can earn college credit for as much of their coursework as possible. Some of ours used these tips to rack up as many as 60 credit hours before ever graduating high school. That’s a huge savings of both time and money! Happy to be of service, Molly. And thanks for your encouragement. We’ve been working hard to update the website and make things easier to find. We still have more to do, but are glad to know you like the changes so far. Just wanted to let you know how helpful your simple transcript was today! I needed to quickly prepare one for my older son in order to sign him with with a Charter School and every website was just way too detailed and expensive! Your simple and editable sheet (plus a quick google search to see how many units I should award!) helped so much!!! So happy to hear this, Allison. I’m glad you found what you needed. Thank you so much for making it so easy to download and change as need it! What a blessing! Thanks again! Thank you, thank you, THANK YOU for this! We are considering making the switch to a private school and they were super impressed with my child’s transcript. They were a tad condesending toward homeschooling when we spoke on the phone, so it made me feel great to get such positive compliments when in person. I couldn’t have done it without you!